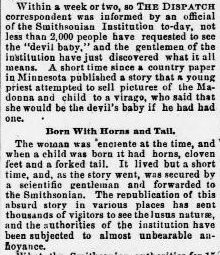 The Columbus Journal out of Columbus, Nebraska printed a bizarre story on January 28, 1891 concerning the blasphemous birth of a cloven-hoofed devil-baby to a Minnesota couple. AN AWFUL MONSTROSITY IN MINNESOTA. A Woman Who Would ‘Rather Have a Devil in Her House’ Than of Her Savior-Believed to Be a Judgement on the Mother for Her Blasphemous Remark. HOWARD LAKE, Minn., Jan. 23-Of all the hideous human malformations ever heard of in the state the 5-weeks-old offspring of Charles and Sarah Miller of McLeod county, is the most atrocious. Accounts of horrible vagaries of nature have from time to time been published, but the awful hoodoo of the village of Plato outdoes all previous horrors.The Millers are a young couple. The husband is a shoemaker, doing a fairly good business, and the Millers had every reason to be well satisfied with the world as they found it until five weeks ago, when Mrs. Miller gave birth to the nondescript creature whose presence has horrified the community and conferred upon the parents an unenviable reputation. The Catholic residents of the village and county are in a ferment of excitement as a result of the statement made by Mrs. Miller anent happenings preceding the birth of the monstrosity. Two months ago, three weeks prior to Mrs. Miller’s confinement, a Jewish peddler came to the house selling colored oleographs of the crucifixion. He was told to go about his business, but pressed his wares in such a manner that Mrs. Miller became exasperated and declared that she would Sooner Have the Devil in Her House than the portrait of her Savior. The full meaning of the preference she had expressed did not even dawn on the unfortunate woman until she was brought face to face with the frightful creature to which she had given birth. This child-or, as many persons believe, this devil- was born with hair all over its body nearly two inches long. The face and hands are not exempt; they are similarly coated. The features are absolutely fiendish in expression, and the eyes shine like two little heads from beneath a pair of shaggy brows. It has a tail eighteen inches long. This enfant terrible was provide at its birth with a full set of teeth. Two short, sharp horns protrude from the skull, and the claw-like hands are furnished with claws like those of an eagle. The feet are exactly like the hoofs of a goat, and the hair covering the body is as coarse as goat’s half, and similar in appearance. The creature could crawl from its birth, and, refusing the natural sustenance of a normal child of like age, it left its mother’s side, sliding on its hands and knees all over the house, devouring any scraps to be found. This child devil is now five weeks old, and has already shown itself as a ferocious beast. It snaps savagely at the restraining hand, and the facial expression produced by an effort to curb the tendencies of the creature is inexpressibly frightful. Anxious to See the Freak. The story of the demon-tot made the rounds through a variety of national newspapers with similar details, although in some versions the last name was printed as “Morris” instead of “Miller.” An article in the Perrysburg Journal claimed that the mother had to be institutionalized after the sight of the baby sent her into lunacy. In April of the same year the Pittsburg Dispatch ran a blurb that suggested the story of the Minnesota enfant terrible had been a hoax. Rumors swirled that after the child died, its body was taken to the Smithsonian. Thousands of museum visitors inquired about the “devil baby,” but the staff had no idea what they were talking about. I haven’t been able to find a birth or death record for a Morris or Miller baby born in 1890-1891 to parents matching those names in Minnesota, but that doesn’t mean that such a child never existed. Fabrication or not, it made for one Hell of a story.